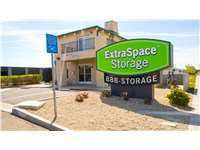 Located on W Ave J8 between 15th St W and 20th St W, Extra Space Storage serves residents of Lancaster. Locals will recognize our facility a few minutes west of Sunnydale Elementary School. With a large selection of storage units, climate control, vehicle storage, and exceptional security, Extra Space Storage on W Ave J8 is the self storage solution you're looking for in Lancaster. Extra Space Storage is a fantastic storage facility. It's very clean. The prices are great and management is exceptional. If you're looking for a great place to store your belongings, I highly recommend Extra Space Storage. I love extra space storage! They are nice & clean and I feel safe leaving my belongings in their hands. They have convient hours and the staff is very friendly. Special thanks to Sara! I love Extra Space Storage!! I have used them more than once and I won't go anwhere else. Climate controlled, immaculately clean (that means a lot to me} and security. Tanisha works in the office and she made the whole process so easy. Thanks Tanisha! I am glad I decided to store my Rv here. The people are always very friendly and helpful. It's very convenient to pay my bill and I don't worry about my Rv. The place is very clean. The staff is very friendly & well informed. When I go into the office am greeted with a friendly welcome and a warm smile. I've been a customer for 3 years and rented more than one unit. This place I will recommend. This facility is very convenient to my house. The staff have always been courteous and helpful. I've rented storage facilities before but this one by far is the cleanest. This Facility is very close to my home and very convenient for me. I haven't had any problems with anything at this facility. Great Job!!! I got great servicie from this facility, i'm very happy and i feel that my personal belongings are safe here. Between 15th and 20th on J-8 accross from The Springs Apartments. Exit Ave J turn left onto Ave J. Turn right on 20th St W. Turn left on J8. Facility on the right. Exit Ave K go straight off the exit it turns into 15th St W. Turn left on J8. Facility on the left. Head West on Avenue J-8 towards the 14 Freeway. Before you hit the Freeway you will see the site on your left-hand side. Head East on Avenue J-8 towards the 14 Freeway. Before you hit the Freeway you will see the site on your right-hand side.